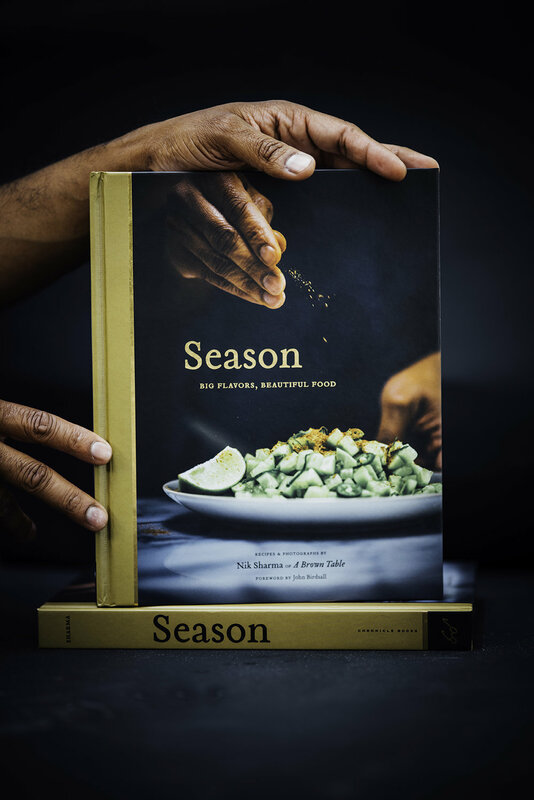 Hi Friends, I can’t believe we’re almost 12 days away from the release of my first cookbook, Season. How do I feel? Honestly, it is a mixture of eager anticipation and happiness and I cannot wait for you to hold a copy in your hands. And with that note, I have wonderful news to share with you! We’re giving away a copy of SEASON and a piece of Staub cookware over at Instagram. When I wrote Season, I wanted to make sure there was something in there for everyone and also take a moment to celebrate the home cook. We all want tasty meals with minimal effort and so I kept that in mind while constructing the recipes in this book. This book is a cookbook with recipes that celebrate my culinary influences from my two homes India and America and I’ve also shared my personal story and how my experiences shaped who I am and how and why I think about food the way I do, I also wanted it to be a useful guide in the kitchen. I’ve included a visual FLAVOR GLOSSARY which makes it easy to identify spices or ingredients you might not be familiar with using a series of macro images that I photographed and cataloged. The book also contains two special technical chapters on seasoning food at home. Every recipe also includes besides a headnote, a special “The Approach” which gives you a quick explanation behind the flavor concept of the dish. Let’s talk about the special news! I wanted to thank you for all your support over the years. As an early preview, I’m sharing the recipe for the spiced beef kebabs from the book with you. And we’re also doing a very special INSTAGRAM GIVEAWAY: To celebrate the release of my book, we’ve teamed up with the lovely folks from Staub USA , Serious Eats and Chronicle Books. The winner will each receive a piece of Staub Cast Iron 8” x 5.5” Oval Gratin Baking Dish and a copy of my book Season. TO ENTER: Head over to Instagram and follow the rules in the image to enter at abrowntable, Staub USA , Serious Eats or Chronicle Books. One of my most vivid memories of going to college in Bombay was heading out with my friends late at night to eat kebabs. Once or twice a week, we’d drive to the south side of the city and enjoy a feast of hot, succulent pieces of seasoned beef, chicken, or lamb, served with thin flatbreads and fresh chutney. Shami kebabs are usually made with ground lamb or beef, dried herbs, and chickpea flour for the binding agent; they don’t require skewers and are cooked in large flat-bottomed woks. This recipe is inspired by the shami kebabs. Serve them with pickled red onions, chutey, or raita. In a large bowl, mix the beef, onion, egg, chickpea flour, chiles, garlic, ginger, lime juice, cayenne, coriander, mint, cinnamon, sage, dill, and salt. Divide into fourteen equal parts and shape into 1 in [2.5 cm] disks. Heat about 2 Tbsp of the oil in a large cast-iron or nonstick skillet over medium-high heat. Fry the kebabs in batches, adding more oil as needed, until golden brown, 3 to 4 minutes per side. Drain on paper towels. Transfer the kebabs to a serving plate, garnish with the cilantro, and serve with the pickled red onions. the approach When making kebabs (or even burgers, for that matter), I often prefer dried herbs because they contain very little to no water and are more potent in flavor than their fresh counterparts. Here the coriander enhances the heat of the chile peppers.